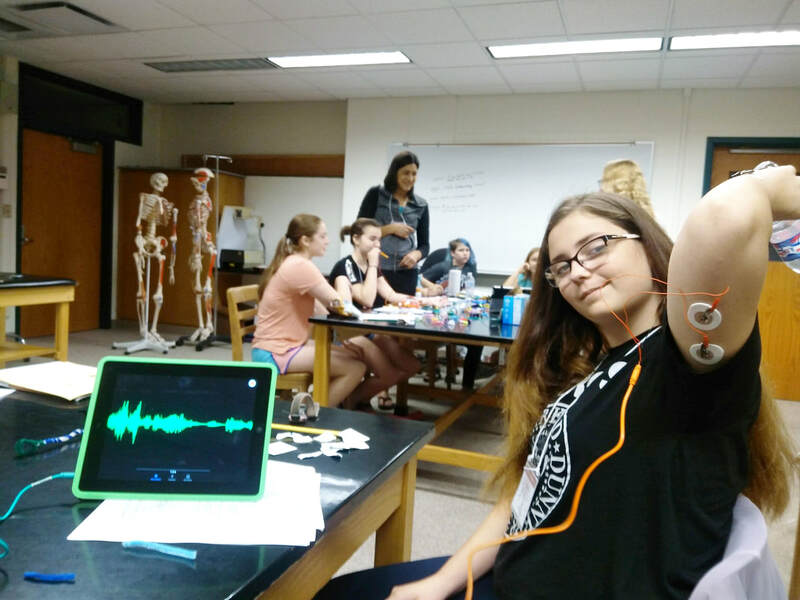 Girls With Nerve is a free, week-long day camp aimed at empowering middle and high school girls to explore neuroscience. While the camp is open to all female applicants, we particularly encourage under-represented groups to apply. Apply here by May 3! Have fun and discover the brain! Comments from the "girls with nerve"
"Going to the labs and getting to see how things are first hand, instead of just hearing about it." "Getting hands on experience with human brains and getting to tour some labs." "Everybody was very welcoming and helpful." "The new experiences and all of the people at camp. The Girls with Nerve camp felt like a very fun, accepting environment. I thoroughly enjoyed being a part of this camp!" "It was very enjoyable and I think other girls will really like and appreciate the information and activities you will provide for them." Jasmine began her PhD in the Kinesiology Department in fall 2015. She earned her BS at the University of Michigan, with a double major in kinesiology and neuroscience. In 2016, Jasmine was awarded a fellowship through the National Science Foundation (NSF) Graduate Research Fellowship Program (GRFP). Part of her proposal was to develop Girls With Nerve at IU, based on a similar program she assisted with at the University of Michigan under Dr. Kristine Snyder. In 2013 Dr. Block completed a postdoctoral fellowship in the Human Brain Physiology and Stimulation Lab under Dr. Pablo Celnik at the Johns Hopkins University School of Medicine. She received her Ph.D. in Neuroscience in March 2009 at the Johns Hopkins University School of Medicine. Dr. Block did her thesis work in the Motion Analysis Lab under Dr. Amy Bastian. She graduated from the University of British Columbia (Canada) in 2002 with a B.Sc. in Biology. Girls With Nerve is sponsored by Indiana University Bloomington's School of Public Health, the Women's Philanthropy Leadership Council, and the National Science Foundation.